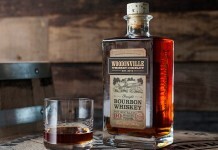 It’s really no surprise that, with such fervent frenzy among consumers over the high end of the American whiskey market, a whiskey from the low end of the spectrum would emerge with some solid buzz. This is the case for Heaven Hill Distilleries’ Mellow Corn Kentucky Straight Corn Whiskey, which sells for a whopping $12. Mellow Corn is one of those brands that has been around forever (the bottle bears the copyright from 1945), but has been hiding in plain sight, along such heritage brands as Old Crow, Old Overholt, and Old Grand-Dad. These whiskeys are often found on the bottom shelf of a liquor store’s whiskey section and often sell for under $15. With bottles of American Whiskey fetching jaw dropping prices at auction, it’s easy to forget that most American Whiskey used to be found in the low end, low price section. It wasn’t until Buffalo Trace released the first single barrel release in 1984 (Blanton’s Single Barrel) that the whole high end of the American Whiskey market was really established. One of the things that’s really helped the American Whiskey segment be so successful is that it has historically had an exceptional price-to-quality ratio. You can find high quality whiskeys, affordable enough to drink on a regular basis, including Wild Turkey 101, Maker’s Mark, Larceny, and Bulleit Straight Rye. 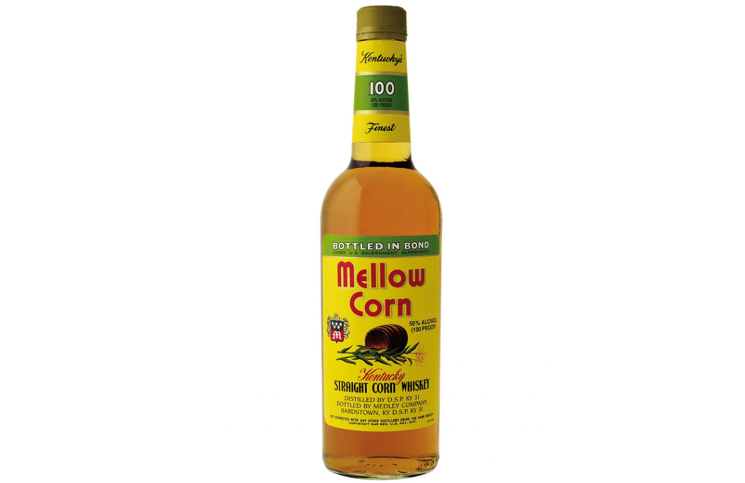 Mellow Corn Straight Kentucky Corn Whiskey is kind of an oddball entry in the American Whiskey space. There are a few true corn whiskeys out there (including most notably Finger Lake Distilling’s Glen Thunder and Balcones Baby Blue Whiskey) but the majority of them are being sold as Moonshine. 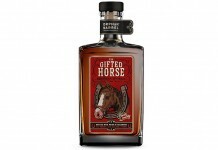 As with bourbon, there are fairly strict rules on what you can call corn whiskey: it must be made of at least 80% corn and aged in non-charred or used barrels. 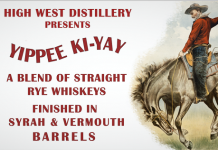 If you age that corn whiskey for 2 or more years you can call it “Straight Corn Whiskey”, and if you take the additional step of bottling it “in Bond” then it needs to be at 100 proof / 50 % ABV and at least four years old. Mellow Corn Straight Kentucky Corn Whiskey (100 proof, 50% ABV, $12) – pale gold in color, this whiskey is considerably lighter in color than most other whiskeys this age, mainly because it’s been aged in used barrels. The nose on the Mellow Corn is anything but mellow – at first nosing it’s spicy and vapory, clearly showing off its proof. Once you get past this initial blast, the nose is very corn focused with caramel corn combining with cinnamon, oak, and green apple. The entry for Mellow Corn is slightly less fiery than the nose, but it’s still quite spicy, combining a core of sweet corn with apple, cinnamon, clove, and black pepper. At the start, Mellow Corn has a nice weighty mouth feel, which transitions as we get to the midpalate where things quickly dry up. In the midpalate the level of heat and spice really ramp up and you get strong black pepper, oak, and cinnamon. In the midpalate we also get a blast of heat, again showing off the fact that we’re at a solid proof. The finish for Mellow Corn is dry and edgy with a faint hint of corn and a slightly bitter charred note. Mellow Corn Whiskey isn’t some hidden gem or diamond in the rough. It isn’t going to win in a head-to-head tasting with something like Wild Turkey 101. What it is, is a novelty, a very low priced, heritage brand that delivers a huge punch of heat with some nice corn flavor and spice. This is the kind of cheap whiskey that you throw back with a crappy light beer in a hipstery “dive bar” and talk about the good ole days – you know, the 90s. 77 points. Mellow Corn Whiskey isn't some hidden gem or diamond in the rough. It isn't going to win in a head-to-head tasting with something like Wild Turkey 101. What it is, is a novelty, a very low priced, heritage brand that delivers a huge punch of heat with some nice corn flavor and spice. This is the kind of cheap whiskey that you throw back with a crappy light beer in a hipstery "dive bar" and talk about the good ole days - you know, the 90s.